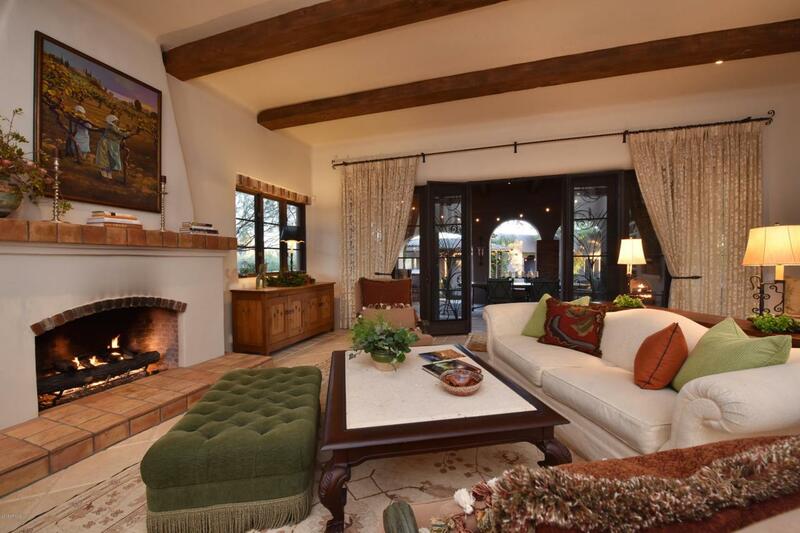 Charming & intimate define this true custom residence located on a private acre lot in the gated Desert Highlands. Echoes of Southwest inspiration create a pleasing palette perfect for the most discriminating buyer. True to the uniqueness of the home, the outdoor areas reflect a backyard paradise complete with loggia, patios, courtyards, breeze ways, gardens, pool with fire & water feature, private spa, decorative landscaping and stone paver work, & an upper view deck with panoramic views including famous Pinnacle Peak & city lights. Traditional living spaces flow seamlessly while offering individual gathering spaces perfect for everyday living & entertaining. A completely detached guest house equal in charm to the main house, has two ensuite bedrooms, living, dining, & kitchen areas.